Evanston Police Chief Richard Eddington sits at a Human Services Meeting. Eddington announced his retirement from the EPD Monday. Evanston Police Chief Richard Eddington announced his retirement from EPD at a Monday press conference. Eddington, who has served as police chief since 2007, said he will officially retire at the end of December. During his announcement, Eddington — who has served over 44 years of police service — thanked members of the Evanston community, the Evanston Police Department and his family for helping him come to this decision to retire. 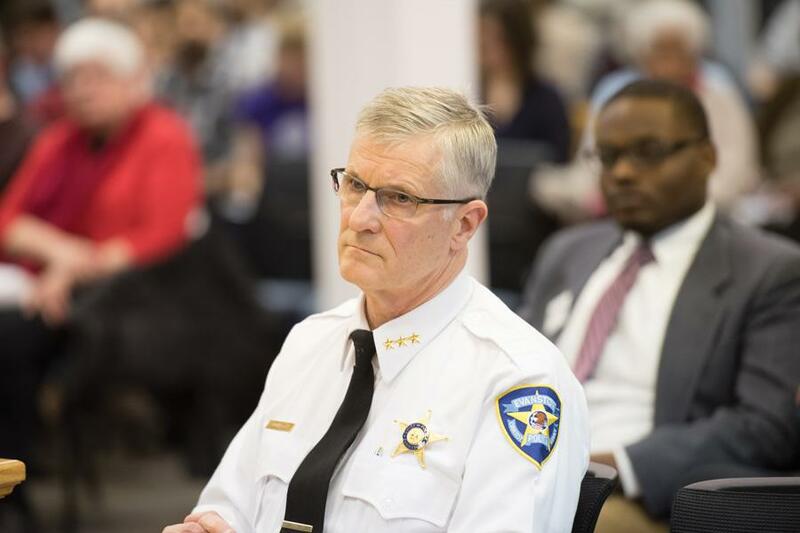 During his time as police chief in Evanston, he oversaw the implementation of the body camera program, reinstituted foot patrol and reestablished the EPD Explorers program, a youth program to connect with the community. While serving as police chief, the number of part one crimes in Evanston also decreased, Eddington said. Part one crimes include offenses such as murder, assault or burglary. In 2007, there were 3,107 part one crimes reported in Evanston compared to 1,900 in 2017. He added that the decrease in crime shows the “ability and dedication” of Evanston police officers to connecting with the community. Eddington said he hopes to play a part in the selection of the new chief, but that the process is decided by City Manager Wally Bobkiewicz. Bobkiewicz said the city will be contracting a firm to search nationally for Eddington’s replacement and will hold at least one community meeting so that the Evanston community can voice what they think should be the “profile” of the new police chief. Bobkiewicz added that it’s possible that the new chief could be selected from current EPD staff and encouraged members who are eligible to apply. Evanston Mayor Steve Hagerty spoke at the press conference and thanked Eddington on behalf of City Council and the Evanston community for his years of service in the EPD. “This chief has proven over the last 12 years to be a tremendous collaborator with different city departments, different non profits in this community and different organizations that all together that is making this a really really safe place to live, to work and to play.” Hagerty said. In his last six months as police chief, Eddington said he’s committed to helping the EPD make important budget decisions, as the city is facing a multi-million dollar deficit for fiscal year 2019. He said that his decision to leave was not primarily influenced by the “difficult budget decisions” the department may face. After he retires at the end of December, Eddington said it’s the first time he will be without another job to go to but will probably stay in Evanston with his family. “I’m looking forward to spending more time with my granddaughters,” Eddington told The Daily.